Kathi here from over at Deliciously Yum. We’re talking breakfast today. Even though it’s not my personal favorite of the day, breakfast foods eaten at any other time, definitely have my heart skipping a beat. With the holiday season just around the corner, I started thinking about special breakfast treats that will keep you satisfied and full until it’s time to dig into that holiday dinner you’ve been waiting for all year. And in order to keep things fun and festive, I decided to put a twist on one of our family favorites. 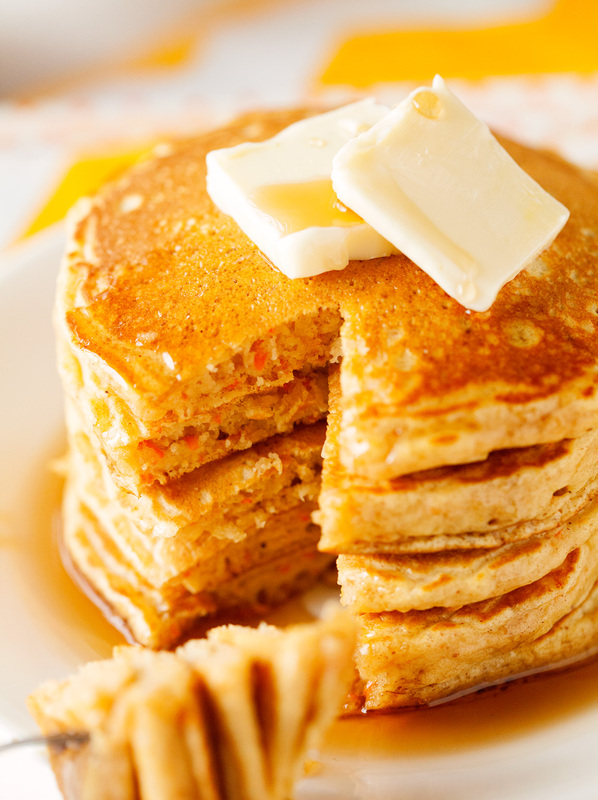 Best ever pancakes are upping the ante with the wonderful flavors of carrot cake. Classic carrot cake spices like cinnamon, nutmeg, and ginger are shining alongside grated carrots (which make the pancakes even more amazing and moist) and transform pancakes into an indulgence you have got to try for yourself. 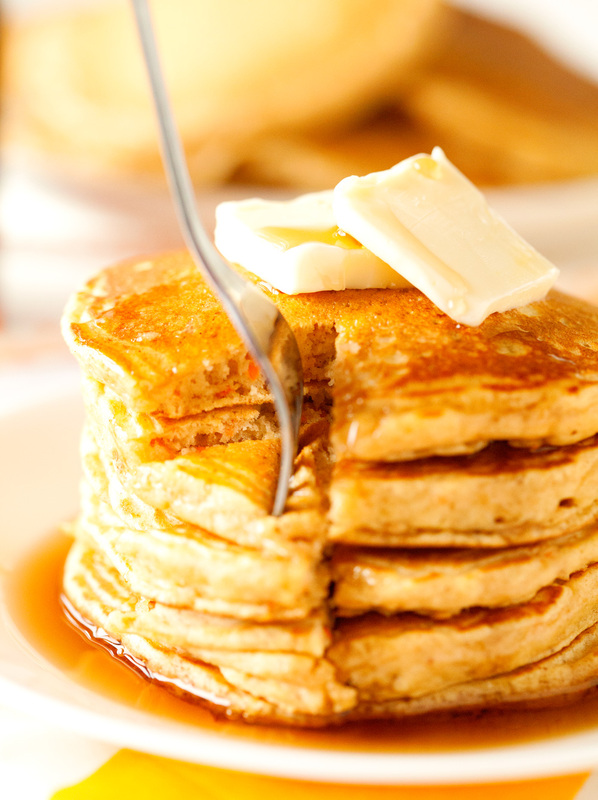 Topped with a healthy amount of butter and dripping with maple syrup, I am pretty sure hardly anyone will be able to resist a stack of these. There’s not a doubt in my mind. You might even want to consider making a double batch, especially if you’re feeding a crowd. You won’t believe how fast they disappear and just in case you do have some leftovers, these pancakes freeze extremely well. 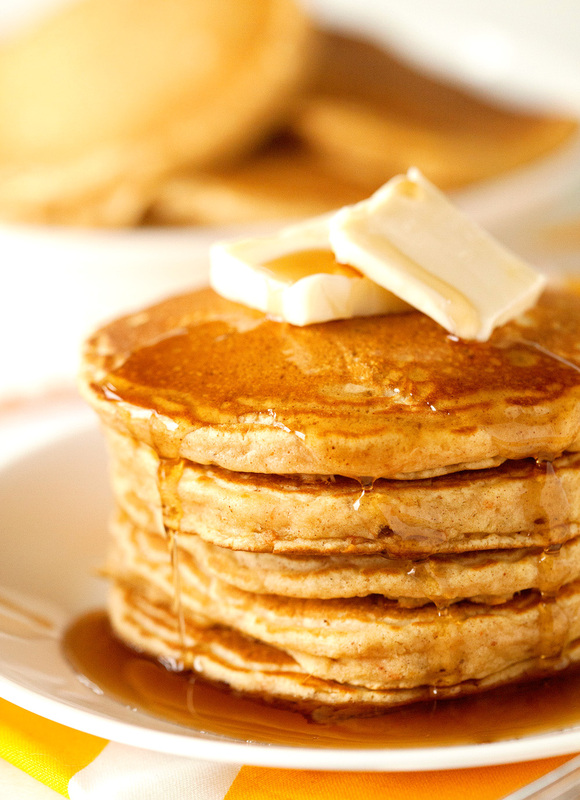 I love carrot cake in any form and these pancakes look perfect! This is just so great!!!!! Accent on the "cake" part of "pancake"...love it! I am wondering how I would adjust the recipe for waffles. My boys would LOVE these!!! These are pretty amazing. I love it! Pancake perfection! Thanks for a great variation on traditional pancakes! As the weather has turned colder, the spices in this dish are very comforting. I love the addition of the carrots, not just for the flavor but to get more vegetables in my boys menu whenever and wherever possible. I made this recipe as part of an easter brunch - how delicious! Everyone was very impressed with it. Not sure what I did wrong, as I followed the recipe exactly as written. But these pancakes stayed wet on the inside no matter how long I cooked them, and the taste was just off. Not to mention, a little salty.